We are a chief Manufacturer, Exporter & Supplier of Silver Dry Fruit Boxes. We make the Silver Dry Fruit Boxes using best grade silver. 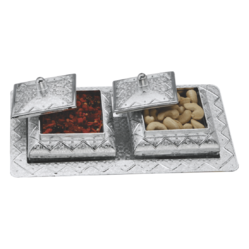 These Silver Dry Fruit Boxes are widely used for decoration and gifting purposes. Because of their intricate detailing, smooth polishing, and antique look, these Silver Dry Fruit Boxes are appreciated by the clients spread all across the world. We are committed towards manufacturing optimum quality products including Silver Dry Fruit Box for our valued clients. We are well renowned in trading and supplying the vast array of Decorative Dry Fruit Boxes that is widely demanded among the clients for their durable finish. These boxes are fabricated with keeping in mind the appropriate norms and standards of the industry. We are offering Silver Dry Fruit Box to our clients. Due to our years of expertise in this realm, we are readily affianced in presenting an exceptional quality variety of Silver Dry Fruit Box.